The Black Void Of Space EP 00/2 is the second 12" from Resoe´s debut album. It consists of two tracks from the album and a remix by no other than Don Williams of Mojuba / Wandering & A.R.T.Less Records. Nachhall is a atmospheric track, but still aimed for the floor. The metallic chords and lushfull strings builds up slowly through the track and ends in a pure techno monster like the old school sound of Detroit. Dubcuttin´ is Resoe´s expression of a Dubstep track, with a more Techno kind of edge to it, which goes perfect with early releases of A Made Up Sound / 2562 and Martyn. 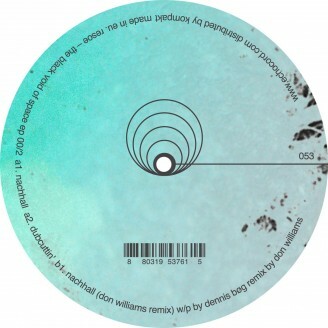 Don Williams´ remix is a straight Detroit inspired track, with hard stabby chords and filtered fx´s that for sure will kill your ears on a proper PA system. If you like Deep Dub with a Twist of Detroit, you must check this out.....!